In addition to driving sales online, Facebook Advertising is beginning to drive in-store sales and footfall too with features such as location targeting, enabling retailers to target users in a specified area. Facebook attracts 2,234 million users to its platform monthly, and that’s excluding its other apps like Messenger, Instagram and WhatsApp (Statista). In addition, increased pricing and ad engagement has driven Facebook spend up, with 48% Y/Y spend growth (Merkle). One of the first things you’ll want to do when setting up your Facebook Ads is set up a Business Manager account. If your business is small, it’s not necessary but advised. It’s also more secure than a regular Facebook page. In the Business Manager menu, you will need to click on the Ads Manager link and from there you will be able to set up your ad campaigns. In order for your ads to be successful, you’ll need to target the right ads to the right people, which does require a bit of work. This is best done by optimising and continually managing your product data. You’ll need to consider four core elements of your product data: titles, images, categories and descriptions. These need to be accurate and optimised for user searches, and because each channel (paid search, marketplaces, social media) require different formats, it’s important that you have a way of sending it out in different formats to each. This means the product data you send to Facebook needs to be optimised according to their requirements. Download our data quality ebook for more information on how to increase sales with product data. 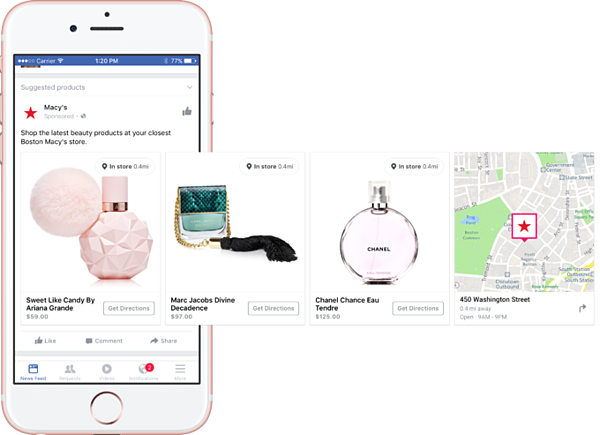 Not only are Facebook Ads invaluable for your online store, they can also increase your offline stores’ footfall through Facebook geo-targeting. Having a marketing strategy which incorporates both online and offline is one of the best ways to ensure your business continues to thrive. In fact, 1 out of 10 people open the Facebook app while in a store (Facebook Behavioural Analysis) and 56% of shop purchases are influenced by digital (Deloitte Digital). Facebook's Store Visits objective outlines the way in which their Ad service can be used to draw more consumers into physical stores. Store visits: available only to eligible advertisers and optimises for the lowest cost per attributed store visit by increasing delivery towards customers who are more likely to visit a store. Learn about how you could become eligible here. Reach: available to all advertisers and optimises for daily unique prospects and shows “Impressions” as the default metric within Ads Manager reporting. The ads provide directions, powerful call to actions and the option to send messages to the business. 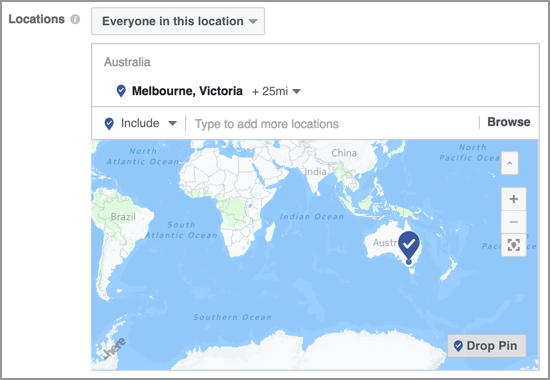 Connecting your ads to Facebook Locations is the only way to effectively target consumers in radius to your offline stores; increasing footfall and sales (you cannot use the Store Visits objective without it). By doing this, Facebook will be able to surface relevant ads on their mobile devices when a consumer is near, using technology such as ambient Wi-Fi, beacons and historical local information. If executed right, your Facebook Ads could have a profound impact on your ROI; bearing in mind your product data must be optimal for this to happen. 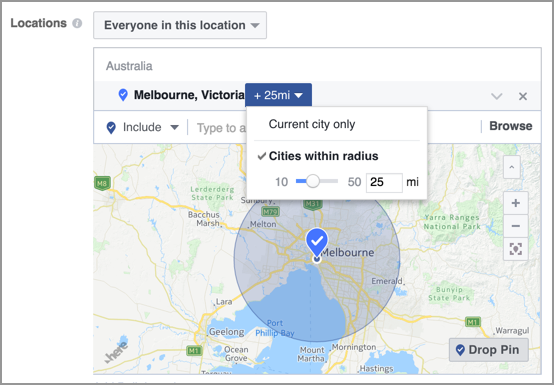 Location Targeting, which can be done after enabling Facebook locations, is one of the best ways to digitalise and aims to attract consumers into offline stores via their mobile devices. Retailers are now tailoring their ads to reach certain groups of consumers instead of pushing one generalised ad out to everyone, eliminating the idea that ads are simply annoying, irrelevant occurrences. Targeting can be based on interests, or now, location. Everyone in this location (default): This can be used for targeting anyone within a certain location. People who live in this location: This targets people who live in a certain location. Facebook suggests that this be used to attract them to a local retail store. People recently in this location: Targets anyone whose most recent known location is in a certain area. Facebook suggests that this be used to advertise time sensitive sales. People travelling in this location: This targets people who are more than 125 miles from their home location. Facebook suggests that this be used to advertise rental cars. Facebook can even find high-population areas for you, so you don’t need to know the names of the locations. This will help with targeting people who live in the places your businesses reside in. Read more about that here. Other options include being able to drop a pin on a map and target ads to people within a certain radius to it and bulk uploading locations if many are required. You can also adjust the radius with a slider. Now that we’ve gone over Facebook’s features, there are a few general technologies that will allow you to target your ideal audience. Retailers can now understand a consumer's precise location based on their device’s GPS reference. A geofence is a virtual area which triggers a response (e.g. text message, email or app notification) once a device enters or leaves with offers, for example. This method increases personalisation which will make customer loyalty more likely. It is also possible to use dwell time, an indication of how long a person was in the specified area, to trigger a response after a certain amount of time. Companies can then use personalised ad content to target individuals. Content can be delivered to a consumer based on their geographic location using postcodes, IP addresses, device ID or via GPS signals and geo-fencing. This means that ads can be tailored based on location to draw a consumer into a store. Proximity marketing focuses on making content sent to the consumer as relevant, timely and as personalised as possible. The ability to detect the exact location, down to the department of the store they may be in, is an important factor in this. Beacons detect a device’s location down to 1 meter using small Bluetooth devices that send Low Energy signals (BLE) to smartphone and tablets in proximity. This method requires the Bluetooth on a user's device to be turned on, and for the user to have opted-in to receive signals before beacons can detect it. 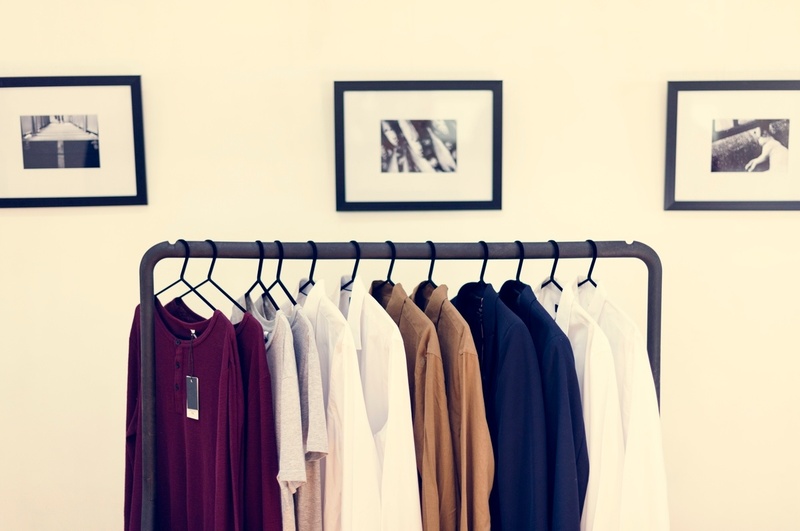 In-store beacons can emit signals for over five years and cost very little. A good method would be to target offers at consumers when they are in your store or nearby so that they are more persuaded to make a purchase. Will Beacon Bluetooth Technology Benefit My High Street Store? With the right strategy and technologies, bricks-and-mortar stores could thrive, and Facebook geo-targeting is a great way to begin. Not only do consumers still love high street shopping, it is convenient and a great way to power brand and retailer success. The opportunity with local advertising is huge and could make a profound difference on your performance this Christmas. For more information on how we can help with your local advertising across multiple channels and with local stock management, get in touch with us or if you’re a client, speak to your CS manager.